What is WoW Crap Cleaner? 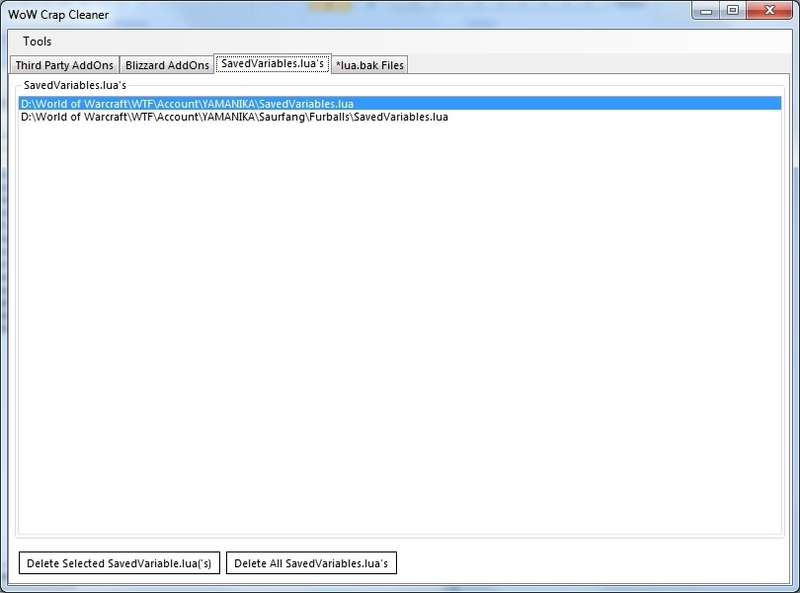 WoW Crap Cleaner is a tool to clean your World of Warcraft directory. The program scans your AddOn directory and WTF directory and then shows the results in a few tabs. Which files is WoW Crap Cleaner looking for? WoW Crap Cleaner looks for your installed AddOns, *.lua files, *lua.bak files and SavedVariable.lua and shows it all in organized tabs. 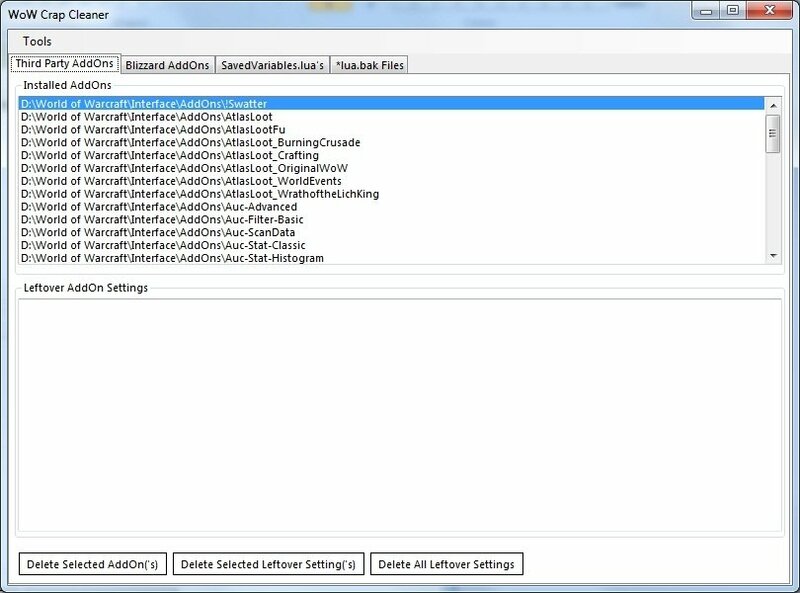 WoW Crap Cleaner has a tab for unofficial Blizzard AddOns, a tab for Blizzard AddOns, a tab for SavedVariable.lua files and a tab for *lua.bak files. Why should I use WoW Crap Cleaner? You should use WoW Crap Cleaner if you want to scan for settings that are left over by deleted AddOns, if you want to reset a Blizzard AddOn by deleting the setting of that specific AddOn, if you want to delete a specific SavedVariable.lua or want to remove all *lua.bak files. IMPORTANT: Before doing anything with my program, make sure you backup your directory first. My program has a neat little button that automatically creates a backup of your Interface and WTF directory with the date of the backup. Use my program at your own risk! Comments and suggestions are appreciated! I got back to the game after a break and decided to check if my program still works since I had a lot of leftover settings after a year or so with installing and removing AddOns. I just tested it and it still works. I do recommend to do a manual backup first (always be safe!) but after that, the program is still safe to use and it clears leftover AddOn settings like it always did. 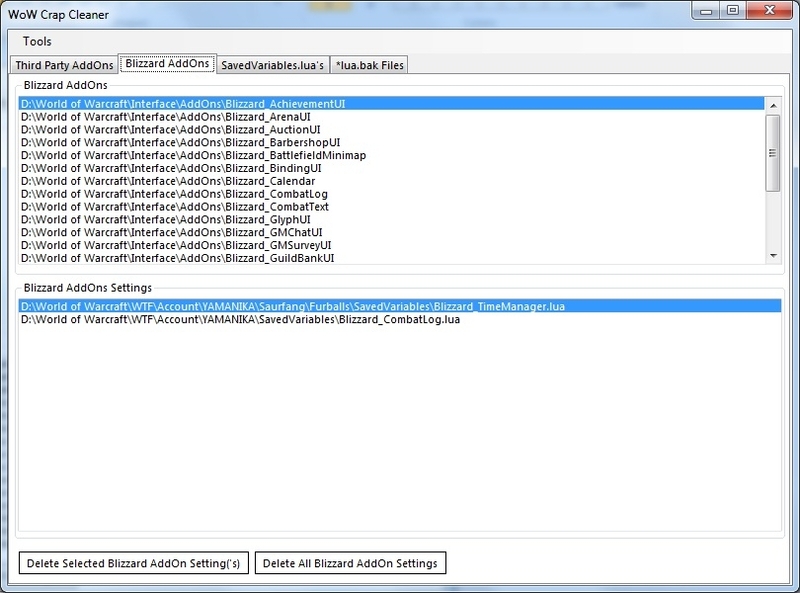 It does not display any data in the upper table of "Blizzard AddOns" since Blizzard doesn't show those there anymore so that table will remain empty. I tested it on Windows 10 x64 edition on the latest Windows Insider Preview. 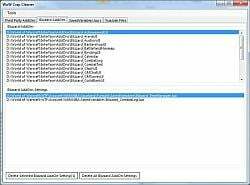 I would like to recreate the program (lost the source) but have not programmed in years so I need to re-learn programming again. *Changed the program layout once more. Should be less buggy now and work correctly. *Added program icon. Thanks Sparanoid! *Button "Create Backup" and "Search" are back! :). *Added the ability to delete multiple items. *Added the ability to resize the result windows. *Added the ability to resize the program. *Added menu item to reset the layout to defaults. *Placed "Create Backup" and "Search" options into the "Tool" menu. *Fixed the way how settings are saved. Pressing "OK" in options now saves the settings immediately instead of on program close, and pressing "Cancel" will actually revert to the old settings it had before changing it. 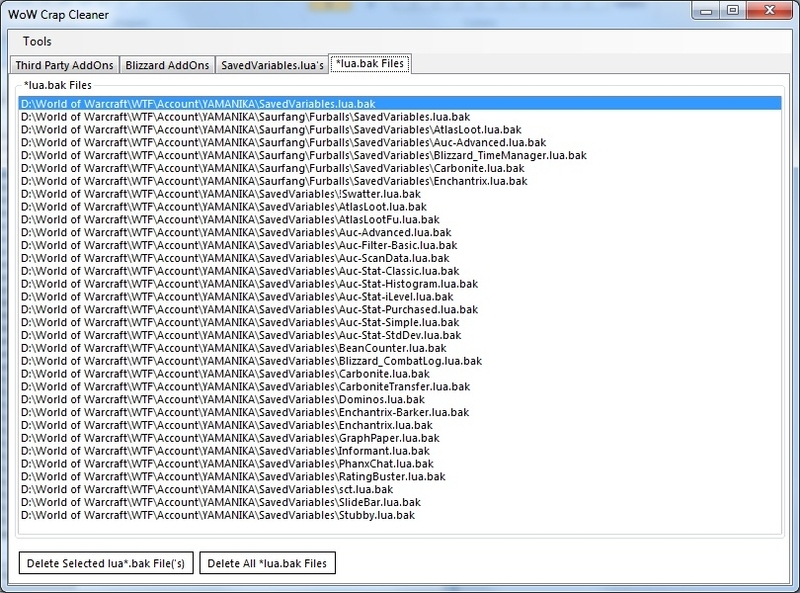 *Added copy file dialog when making a backup, to show the user detailed status information of the progress. 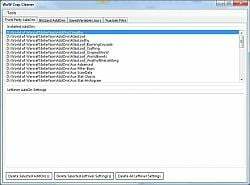 *After pressing search, or deleting a AddOn (which in turn also performs a search for leftover settings of that AddOn), the first item is selected in all of the lists (if there is at least one item in the list present). *Added a few checks to prevent the program from crashing. *Small tweaks to the layout. *Added progress bar when deleting multiple items. Thanks. Used it today and worked a treat. Just wanted to confirm that I have been AFK from this AddOn for quite a while because I can't find a fix for some of the mentioned problems, and that I don't experience them doesn't help either. I might look into rewriting it, if it is still used by many people. I HAVE to rewrite it because I lost the source in a format quite a while back. (Also the reason for being AFK from this AddOn). Sorry for some of the bugs that are present! The program works, but you need to keep a few things in mind. I LOVE this tool. Been using it for a little while, but I recently took a break from the game and when I came back I forgot all about it. I installed a UI mod that comes with a ton of leftover addon settings that I didn't know about. I started getting really weird texture problems, like shimmery transparencies and stuff. I ran this and removed a ton of leftover settings and the problem disappeared. Any ideas why? Either way I'm soooo in love with this lol. It's safe to assume this program has been abandoned since it hasn't been updated in nearly a year and it is still in beta. Since it has severe issues, in my opinion, it may be a good idea to stay clear of it. I had the same problem with this program until I renamed the Backup folder to something else. Then it worked without any troubles. 3. It seems to not work at all if I hurry to an action just after booting it. My practice: wait a good 5-10 seconds after booting it up. 5. Though I don't know anything about code or how this works, it seems to me that the problem lies somewhere in telling the addon to do something when it hasn't finished another process or can't find something to do, (whether that be booting up, searching, backing up, deleting settings, scrolling to view the Leftover AddOn Settings or switching tabs...). My practice: handle the add-on like I would a young child... meaning: not rushing it through each task, not asking it to do more than one thing at a time, letting it finish each step before moving on to the next and when it does mess up (aka freeze), wipe the slate clean and give it a fresh start. So, yes, this AddOn does have issues. But IMHO, the benefits of this little gem FAR outweigh it's idiosyncrasies. As long as I respect those idiosyncrasies, it keeps my files squeaky clean! Last edited by RosyBijou : 02-28-10 at 07:25 AM. 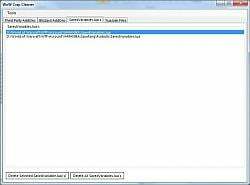 Hi, this program worked fine for me when I clicked "delete leftover files". However, when I then selected a third party addon and clicked "Delete", it froze up. 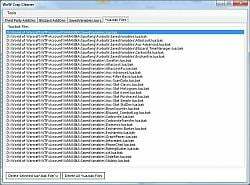 Checking the Addon folder, the addon I wanted it to delete had indeed disappeared, but the program had ceased responding. Also, I'm curious why this program needs to connect to the internet? My bandwidth monitor program popped up a permission box for this program, and when I clicked "No", it promptly had an error and closed. It opens fine though when allowed to connect to the net. *Edit: I'm using XP and have Framework 3.5. Last edited by Aisenfaire : 10-13-09 at 06:50 AM. Running Vista Home Premium 64bit SP2, with .net fully up to date, and the freezing is random, but this works less than it "freezes". I too have the issue with it freezing (Non Responsive) when I click search. I Filled in all the folder options correctly, I do have the latest version of Microsoft Framework, and the first time I downloaded and ran this software, it ran fine. Since then I have run it a few times just to make a backup and never had any problems, however sicne that first run I have not clicked the search button, only the backup button, this morning I tried to do another scan and I started getting this freeze. I tried rebooting, restarting the program over and over and it seems to happen every time, so basically after my first install and run the search button no longer works. Running Vista Ultimate x64 here. Are there any logs I can provide you with to maybe help find a solution? Thanks for the great program! Last edited by thebakhatman : 06-25-09 at 10:09 PM. No error msg, it just freezes completely when i click search - (not responding) in the title bar. The only way to close it, is using the task manager. Do you have the Microsoft.NET Framework 3.5 installed? That is needed for my application to run.